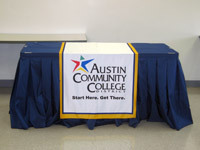 Campus managers have a tri-fold table top display, table drape, and banner that are available for loan for events. 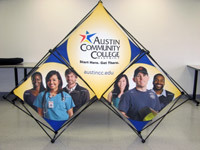 The Office of Communications and Marketing (OCM) has a large display unit (floor to ceiling) and a tri-fold table top display that can be borrowed. 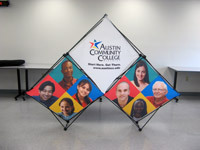 Note, it is the client's responsibility to provide graphics and other elements for display. 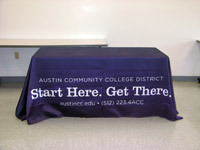 Table Displays Each campus manager has an official ACC tabletop display and table drape for use at special events and recruitment fairs. 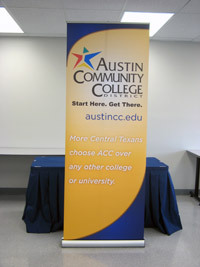 OCM also makes available a vinyl banner as well as a tabletop and a large, convention center size display for use if the campus supplies are unavailable. Please contact your campus manager or OCM Event Manager Dahlia Anzaldua at least a week in advance of your event. Graphics You want your graphics to grab someone's attention, but they also shouldn't take up too much of their time. If you're including text, be sure to use large letters, and keep the message clear and concise. In the few seconds the viewer will spend walking past your booth, let them know who you are, what you do, and how you can help them. Be visible, friendly, and assertive Don’t sit. Show your enthusiasm…it’s contagious. If no one is stopping by, walk around the event, encourage others to come to your booth. Make sure there is a reason they would want to stop by. Demonstrations, if possible, are always good for booth traffic. Think benefits. Remember, this is about providing the information they want, not about what you want to tell them. If you don’t know the answer to one of their questions, write it down, get their contact information, and tell them you will find the answer and get back with them within the next two days. Then make sure you do it! Promotional products Think about something useful, small, and unique. If you're giving away higher-end promotional products, it might be better to keep them tucked away so you can give them only to those showing genuine interest. Leaving a basket full of promotional products in front of your booth might generate a high level of booth traffic, but most of the people will be there only for the gift. Order promotional products (key chains, pencils, pens, golf balls, mouse pads) from General Stores. 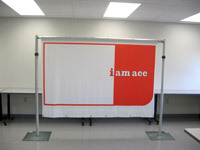 (click on View Form to see the list of available items.) OCM does not stock these items. 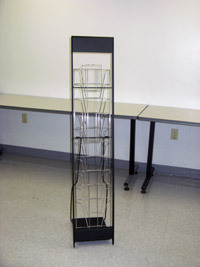 Contact our office for assistance in ordering items not stocked in General Stores. Business cards Always keep these handy. If you rely on them a great deal for leads, though, keep in mind that probably every other booth will be handing them out, too. Try to think of ways to stand out. 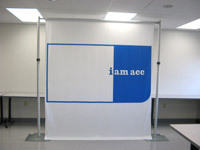 Order ACC business cards from Purchasing. You may also order blank cards for personalizing notes and phone numbers. Brochures and other literature A majority of literature handed out at trade shows ends up on the floor or in the garbage. If you are handing out literature to every person who passes by, it's better to use simpler, less expensive fliers or brochures. Save the literature printed on nicer paper for genuinely interested visitors who have questions. 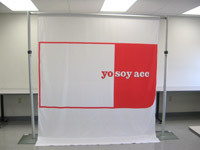 Order ACC brochures and other publications from OCM. Please do not throw away leftovers. You may send them back to us. Somebody else may need them. Lead card These are the best means of collecting information about potential students or clients. Although the main use of lead cards is to establish contact, keep in mind that they want to know you're genuinely interested in satisfying their needs. Find out what they're looking for first, then ask for their mailing information. Be sure to contact them within a few days after the event. Even the best impressions will only last so long without follow-up. After all, this is why you’re there, right?